The following is a written conversation between Editor-In-Chief Evan Tognotti and Senior Editor Matthew Milewski about this week’s episode of Marvel’s Agents of SHIELD. Spoilers, you guys. Obviously. I just finished watching the second episode of Marvel’s Agents of SHIELD, “0-8-4,” and I’m going to be honest with you, Matthew. There was one thought that ran through my head, pervasively: I don’t care. I don’t care about this ragtag group of decidedly non-super heroes; I don’t care about the places they visit or the people they meet; I don’t care when their lives are in danger or when they have a totally rad bonding moment. I. Don’t. Care. I guess we should take a step back to talk more directly about this episode, though, which featured the crew traveling to Peru to investigate an “object of unknown origin.” How do you think it stacked up to the pilot? Hell, do you even agree with my apathy? MM: I’d say this hour was a step down from the pilot, which is to say it was pretty underwhelming. I can’t fully explain why that is, but I think it’s partially due to a complete lack of crackle in “0-8-4″‘s dialogue. Second episodes are some of the most notoriously difficult to do well, but it’s still disappointing that the best “0-8-4” can do is toss out a few character details that could prove potentially interesting down the line. This is of course excepting the post-credits Nick Fury scene, which, while entirely superfluous, was nonetheless a full minute of the show that I enjoyed. Gregg and Jackson have an established dynamic that makes their lines land consistently. It doesn’t really sway my opinion of “0-8-4” on the whole, but I least left the hour smiling. Actually, that’s not entirely true. Perhaps it’s because the material was given a little more care in the post-credits scene, but I’m worried if SHIELD‘s cast is consistently capable of delivering Whedon-esque dialogue. Coulson and Skye are two characters that I have some faith in. But Ward? May? The already tiresome shtick of Fitz and Simmons? I’m a little worried about this show Evan. ET: A little worried might actually be an understatement for me, but I’m trying to stay positive. Like I said, two episodes isn’t a lot of time, nor a lot of show for me to form a full-fledged opinion. I’m worried, though, because of Whedon and Co.’s track record. I don’t especially like the way Buffy, Angel, Firefly, or Dollhouse start, but they had… weight. They were idiosyncratic and interesting in ways that kept me engaged through the weaker bits. Buffy’s trifling first-season was saved by a unique point of view and some excellent chemistry. Angel’s deliberate detective-fiction subversion of Buffy was immediately refreshing. Dollhouse’s initial “monster of the week” problems were also backed by a morally complex and universe. Firefly, well, I don’t think I need to elaborate there. 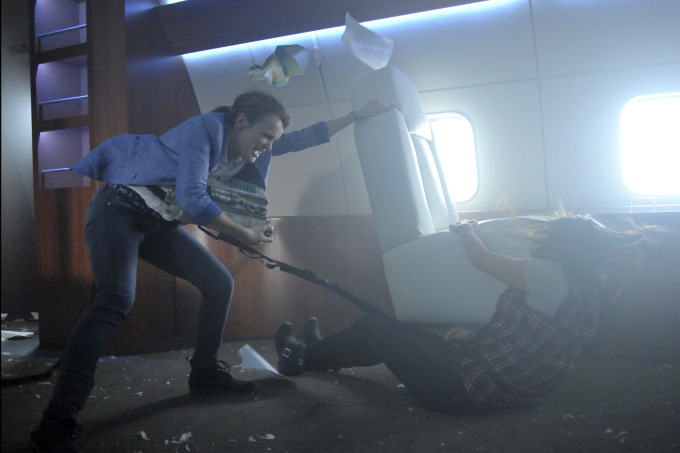 My biggest concern for Agents of SHIELD isn’t quality so much as it’s normalcy. At its best, it feels like NCIS with a couple Whedon-isms and big-budget Marvel coating. At its worst, I find it mind-numbingly tedious. That budget is big, sure, but parts of this show look downright crummy. Something about the color palette, maybe? Hard to pin down. The fight choreography is also pretty lacking; I found myself more confused than thrilled by most of the hand-to-hand fights, thanks to a camera that likes to follow every punch without much sense of its weight. And those characters. Man. Fitz and Simmons barely feel like people, let alone a third of our principle ensemble. May’s stoicism is, as of this episode, pretty uninteresting. Ward is smarmy with no sense of depth or purpose. I mentioned liking Skye pretty well, and I still do, but her wide-eyed hacker idealism is really starting to grate. Even Coulson, who I really loved in The Avengers, feels constricted by his paternal role. What’s next? How does episode 3 turn me around on these situations, these characters, this show? I so desperately want it to. To quote the musical episode of Buffy: where do we go from here? MM: SHIELD might, to an extent, have shot itself in the foot with these first two episodes. The performances are almost uniformly flat, the dialogue captures the fun of Whedon’s too infrequently, and characters are generally uninteresting. My hope is that SHIELD starts fleshing out more of its world. The entirety of Whedon’s catalog has benefited when serialization becomes more prominent (primarily because the dramatic stakes become more involving). Except, and people haven’t shied away from saying this, SHIELD isn’t really a Joss Whedon show. It has his name on it, sure, but I think it’s clear from these first two episodes that Whedon won’t be heavily involved. SHIELD needs to step up its game quickly before it loses itself to mediocrity.